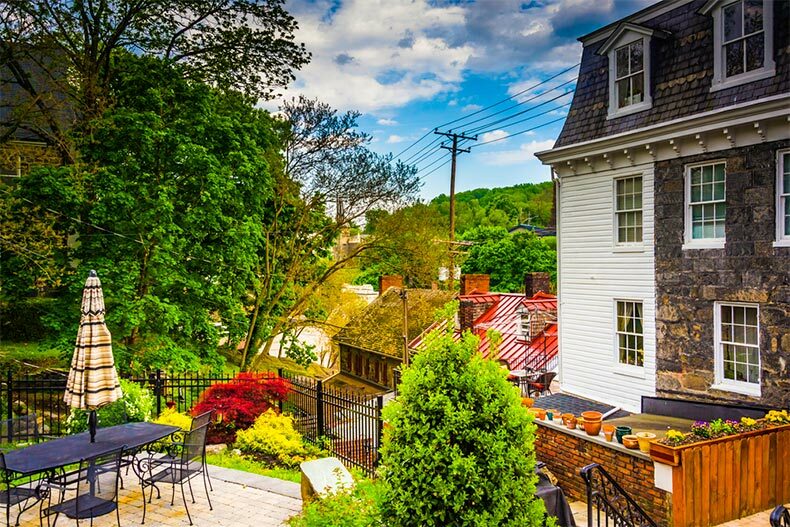 Ellicott City features old buildings that add plenty of charm. Ellicott City has been a popular place for Marylanders for many decades. Centrally located in Maryland, the area gives residents easy access to Baltimore, Frederick, and Washington, D.C. While the historic downtown faced flooding in recent years, the scenic streets with antique shops and restaurants still give the area a quaint feel. Residents experience an ease of living with access to big box stores, restaurants, and grocery stores along Routes 29 and Interstate 70. And for a location adjacent to big cities, the area is surprisingly wooden and rural. Nearby, active adults can enjoy hiking and biking in the expansive Patapsco Valley State Park or golfing and tennis at the Turf Valley Resort. In the newer developments of Ellicott City, active adults can find many great options for maintenance-free living. The area offers seven age-restricted communities, that are all smaller, and have a variety of amenities. Here are five 55+ communities in Ellicott City. Village Crest, just a stone’s throw from the state park and Patapsco River, is the largest 55+ community in Ellicott City. The 406 homes nestle into the planned community of Taylor Village. Open to all residents, the Taylor Village community center offers three outdoor pools, an exercise room, and clubhouse. Residents 55 and over can also use the Taylor Village Senior Center, which provides space for active adults to socialize in the card and billiard rooms or exercise at the indoor pool and exercise room. Attached homes and condos are offered for resale. Active adults looking for new homes and apartment living in Ellicott City should look to Ellicott’s Retreat. This community of 160 homes is currently being developed by Ryan Homes, and is the only community in the area offering new homes. The single building offers two bed, two-bath condos, conveniently located near the intersection of Routes 40 and 29 and I-70. Residents have easy access to shopping and amenities in the area. The community is low-key, with meeting rooms but no exercise spaces. However, Ellicott City Health and Fitness and the Ellicott City YMCA are both less than five minutes away. The Enclave at Ellicott Station is the only 55+ community in the area located north of I-70, giving it slightly more of a rural feel. Williamsburg Homes built the attached homes between 2009 and 2012, and the residences are now offered for resale. The clubhouse offers residents the opportunity to meet and socialize with neighbors. This community is also well situated for golf and outdoor lovers. Within a ten minute drive, residents can find golf courses at Turf Valley and Waverly Woods, and hiking and biking trails in the nearby parks. The Enclave at Ellicott Hills offers active adults the resort-style amenities in a picturesque setting. The attached homes and condominium buildings center around a 6,900-square foot clubhouse that offers an outdoor pool, tennis courts, exercise and aerobic rooms, and plenty of space for the community’s clubs and groups to meet. Bozzuto, known for city-living condos and apartments, built 164 condos with two and three bedrooms, while Chateau Builder’s townhomes are larger, with three bedrooms plus a den. Ellicott Meadows is the most expensive 55+ community in Ellicott City, but it is also the only community that offers single-family homes. The neighborhood of 160 homes also offers resort-style amenities on a smaller scale. The clubhouse includes an exercise room, outdoor pool, and meeting rooms. Neighbors stay active and engaged by attending book clubs, exercise classes, lunch get-togethers, and community-wide social events. The neighborhood also includes scenic ponds and walking and biking trails for residents who want to stay active outdoors.